In the Portal Configuration, we help you configure your company settings, customize fields, groups, and templates, and configure all the project modules with ease. Click in the top band. Navigate to the Portal Configuration section and click Org Settings. Click Choose File and select an image from your local computer. You can also remove the logo by clicking Delete. Supported file formats are jpg/gif/png/jpeg. File size should not exceed 500 KB. Preferred size of an image is 70x30. Click to the right of your company name. Modify the Company Name, Web Address, postal address, and Time Zone. 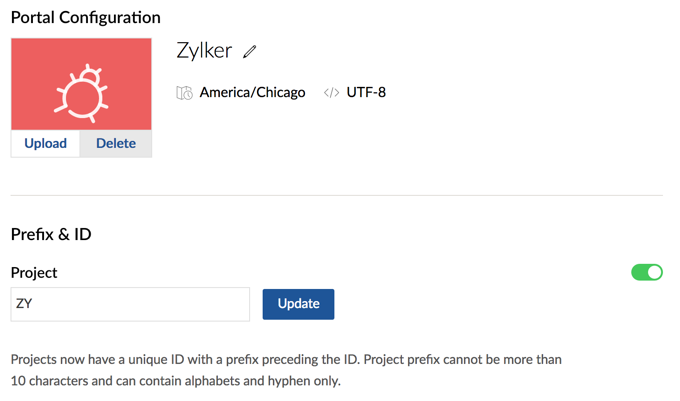 In the Prefix & ID section, you can enable/disable Project IDs. The current project prefix is shown in an editable section. If desired, modify the project prefix and click Update. The Project prefix cannot be more than 10 characters and can contain alphabets & hyphen only. Bug IDs cannot be disabled. Only the prefix can be updated. To send email notifications from your own email address, you can simply configure the Sender Email and domain. Available in Enterprise plan (user based pricing). Enter your email address in the Sender Email section and click Verify. A Hostname and Value will be generated. You are restricted from entering a public domain email address. Login to your DNS manager and add the generated value in the TXT record. Click Verify your domain in sender email settings in Portal Configuration. Once your domain is verified, a verification code will be sent to the email address entered. If you didn’t receive the verification code to the email address, click Resend verification code. Enter the verification code and click Verify Email. After your domain and email address is verified, the Zoho Projects notifications will be sent from the customized sender email address. Your domain verification will fail if you don’t add the generated value in the TXT record of your DNS manager. You should not remove this from TXT record as long as you use Zoho Projects. Click to the right of your Sender Email address. Confirm your action. If you click Change, the current sender email configuration will no longer work. Configure the new sender email address and verify your domain and email address. If you don't configure a new sender email address, the notifications will be sent from the default address notifications@zohoprojects.com. In the Portal URL Change section, the current portal name is present in the editable area. If desired, modify the portal name and click Update. Select New Portal Owner from the drop-down. You can now set date formats, business hours / days and holiday list for your company to precisely calculate the project deliverables. And you can also calculate the bug duration based on the actual number of hours or days. Click Date & Time Settings. Set the Date Format ,Time Format and the First Day of the Week. Set how long the Business Hours are, for a day. Skip Weekends by selecting the working days of your work week. The days unselected will be considered as weekends and the work item's duration will be calculated accordingly. Click Update when you are done with all the above settings. 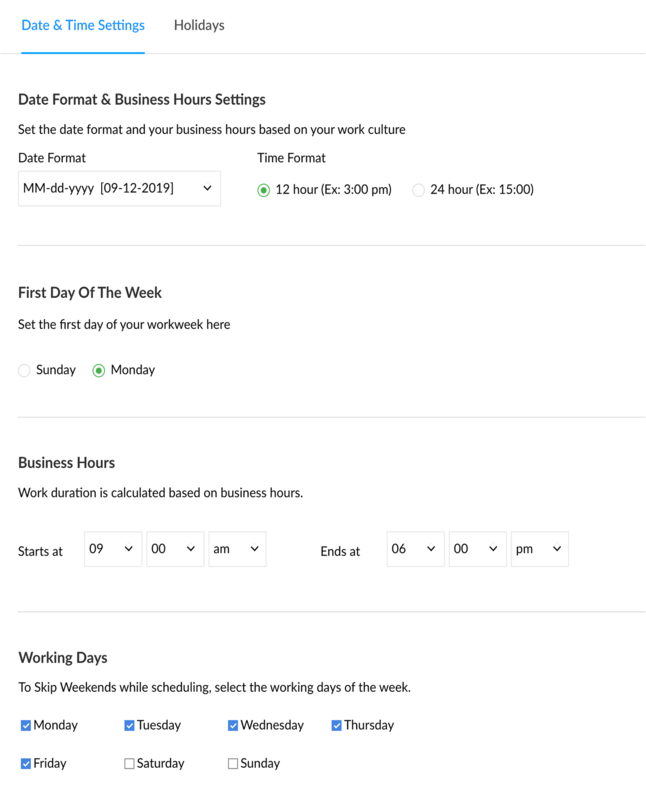 The Business Hours, Skip Weekends, and Configure Holidays settings are available in the Premium plan. The work duration that you define as Business Hours will be taken into account to calculate a work item's duration. Learn to configure holidays in Zoho BugTracker here. Navigate to the Skip Weekends section and click the Configure Holidays link. Enter the holiday details and Add Holiday. To delete an existing holiday, hover over the holiday and Delete Holiday. You can select weekends or holidays displayed in gray color as start or end dates for bugs in pop out calendars. This option is available only in our Premium plan. 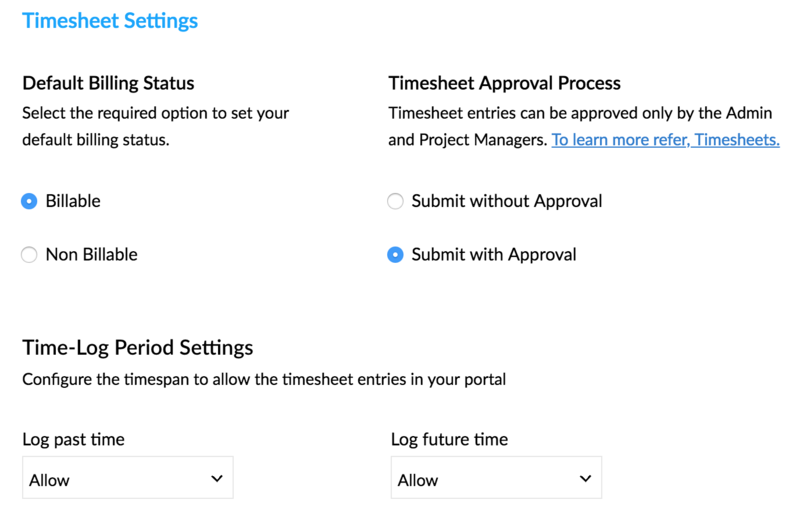 Navigate to the the Timesheet Billing Status and Timesheet Approval Process section. Set your default billing and approval status respectively. Time logs are an effective way to track your users' hours. You can customize your past and future time-log settings, or even remove time logs entirely. Navigate to the the TIme-log Period Settings section. Allow, Don't Allow or Customize. This setting determines whether to log past time. Allow past time logs for any specific length of time. Weekends and configured holidays will not be taken into account when selecting your time-log span. This setting determines whether to log future time. Allow future time logs for any specific length of time. Weekends and configured holidays will not be taken into account when selecting your time-log span. Logging time for a particular bug is added on a daily basis. Logging time for a particular bug on a weekly basis. Logging time or editing an existing time log. Joan wants to allow time-log entries for all past days while restricting entries to only two weeks in the future. Set the Past time-log to Allow- past days. If the current date is 02/15/2017, all the users in the project will be able to log entries for all past days, and only until 03/01/2017 in the future. These settings will be reflected in all date pickers shown above. Changes to the time-log settings will only be reflected when the specified number of days is within the date range scheduled for strict projects. When time-log settings are configured to five weeks before and after the current date (09/19/2016), time cannot be logged because the settings are not within the date range. Click Bugs & Timesheet in the left panel. Scroll the page and navigate to the Rename Bugs Tab section. Enter a Name to be displayed in the Links or Commands across projects. Enter a Name and icon to be displayed in the Tabs across projects. To change the icon for the Bugs module, hover over the default icon and select your favorite icon. A layout helps you structure your form by adding fields. Zoho BugTracker lets you create and add custom fields to the layout. Navigate to Portal Configuration > Layouts and Fields > Projects. Click Standard Layout to add a custom field. Single-line text field: Add one line of text. 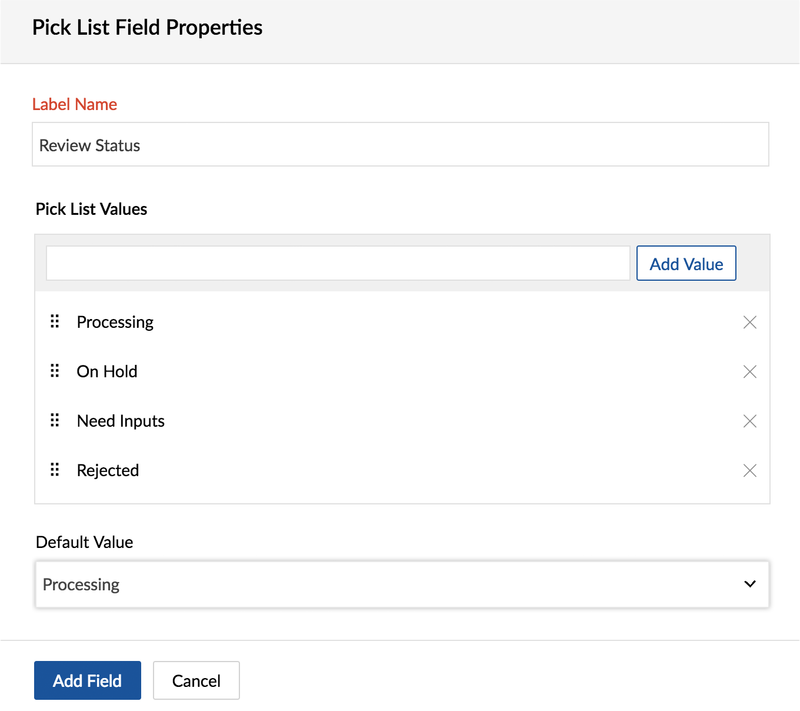 Pick List field: Create your own dropdown using a pick list. Set values and wrap them under a pick list as per your business needs. Number: Store numbers in this field. A number can have a maximum of 19 digits. You can either store an integer or a decimal in this field. Click Add Field to include the field in the layout. When you Cancel, the field is never stored anywhere. 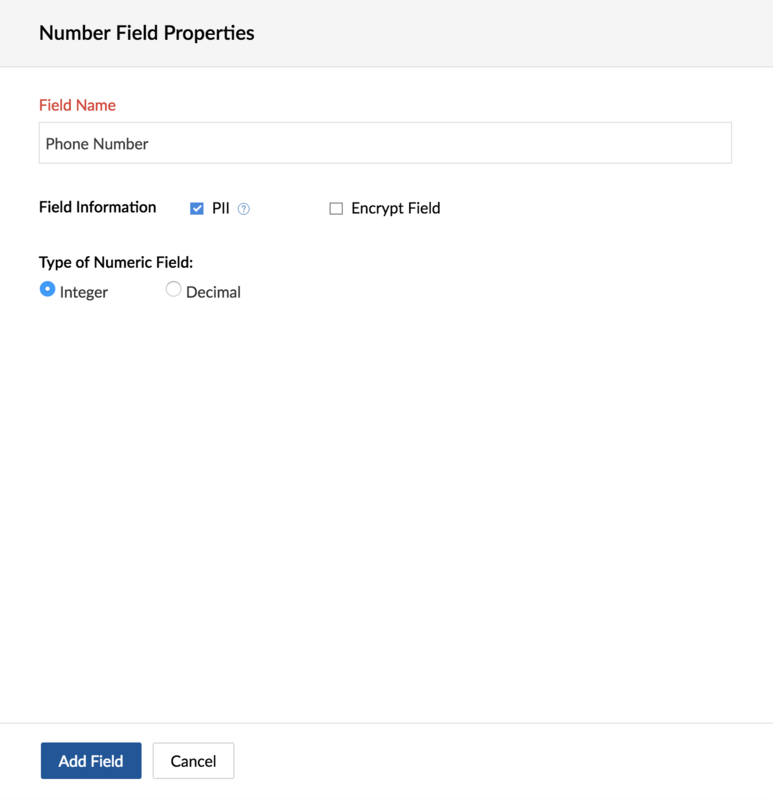 A maximum of 45 custom fields can be created. These fields cannot be duplicated. Removing a field’s association from a layout will not incur data loss in the project. However, deleting a field from the portal will do so. Set a Default Value if necessary. Click the cross icon beside a value to delete it. Select a Default Value if necessary. Click Add Field. Learn how to edit an existing field. Choose whether the number is an integer or a decimal. A maximum of five integers and five decimals can be created. Navigate to > Portal Configuration > Layouts and Fields > Projects. Open the standard layout editor and hover over the custom field you would like to edit. Edit the field properties except the field name. You can change the field name also but the new name will be reflected in all the projects. Custom fields can be edited in Premium plan only. Open the standard layout editor and hover over the custom field you would like to reorder. Drag and swap with another field in the editor. You can reorder fields as many times as you want until you get the desired order..
Open the standard layout editor and hover over the custom field you would like to dissociate. Removing a project custom field will not permanently delete it from the database. The custom field will be moved to the Available Fields tray and it can be reused anytime later from this tray. Navigate to -> Portal Configuration -> Layouts and Fields -> Projects -> Fields. Hover over the field you would like to delete. Deleting a custom field will affect all the projects in the portal. Deleting a field from a portal will permanently delete it from the database.